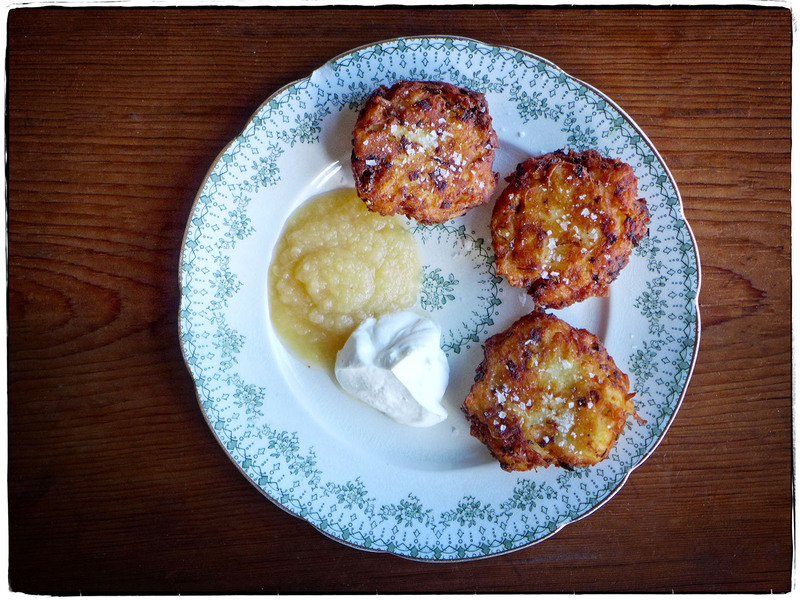 In honor of Hanukkah, we made latkes for lunch. Such a simple recipe: grated Russet potatoes, finely chopped onion, egg, salt, and pepper mixed together, shaped into disks, then fried in oil. We fiddled around with the recipe, as we are wont to do: with grated raw potatoes, grated par-boiled potatoes, even frozen grated par-boiled potatoes. In the end it didn’t really matter, they all were delicious and got us into the spirit of The Festival of Lights—to never be afraid to stand up for what’s right; to perform good deeds; to always strive to be better; and to remember that even one candle can light the darkness. It’s not our holiday but we embrace all that it stands for.